With its prestigious setting in the 8th arrondissement and its elegant Haussmannian architecture, the Best Western Paris Gare Saint Lazare hotel embodies the essence of refined Parisian style. The Champs Elysees, the Opera and Galeries Lafayette are nearby, along with the metro lines for access to other must-see attractions. The hotel has been fully refurbished, with 30 charming sound-proof guest rooms offering a restful retreat. Enjoy amenities including room service, mini-bars, data ports and free Wi-Fi. Some rooms offer balconies with lovely views. Start your day off right with a hot breakfast and enjoy a drink at the 24-hour cocktail lounge. The multilingual staff and concierge are at your disposal for a pleasant stay. 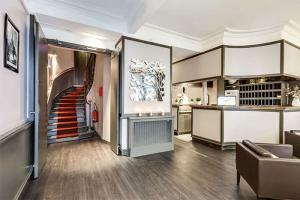 Located in Paris' 8th arrondissement, approximately 16 miles from Charles de Gaulle Airport and 12 miles from Orly Airport. Gare St Lazare is approximately half a mile away. The nearest Metro stop is Europe-Simone Veil, about a quarter of a mile away.